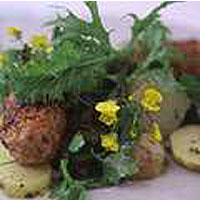 This is scrumptious eaten with a lemon-dressed salad of young, organic leaves and Branston pickle. Gently fry the shallots and garlic in 1 tablespoon of olive oil in a small frying pan over a low heat. Trim the chicken meat and cut into rough chunks. Place in a food processor with the herb leaves and whiz in short bursts, until the meat is finely minced. Do not over-process or it will form a paste. Tip into a bowl and beat in the sautéed shallots, lemon zest, minced pork, mace, salt and pepper. Test the seasoning by frying a small patty of sausage meat. Adjust if necessary. Shape and roll the meat into 12 neat sausages. Chill until needed. Heat 3 tablespoons olive oil in a frying pan, then fry the sausages for about 8-10 minutes, turning regularly. If cooking in two batches, you may need an extra spoonful of olive oil. For the warm potato salad, place the potatoes in plenty of cold water, bring to the boil then cook for about 10 minutes or until tender. Meanwhile, finely chop the herbs and whisk together with the remaining ingredients. Drain the potatoes, allow to steam for a couple of minutes, then peel and slice before tossing while hot in the vinaigrette. Serve immediately with the sausages, which may be served hot, warm or cold.